Sometimes, artists are just as qualified as engineers to envision future technology. Now, an organization aiming to spur the technologies needed for interstellar space travel is asking artists to sketch the vehicles that could take humanity to the stars. 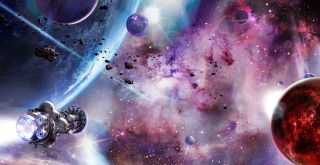 Submissions are open to the FarMaker Interstellar Speed Sketch 2013 contest, being organized in conjunction with a conference on interstellar travel called Starship Congress, to run Aug. 15 to 18 in Dallas, Texas. The deadline to apply is Aug. 1. Journeying: The Daedalus spacecraft bridges the vastness between stars. How does it feel? Arriving: We reach our destination. What do we find? Freeform: A bracket for dynamic and realistic visions we can't yet foresee.